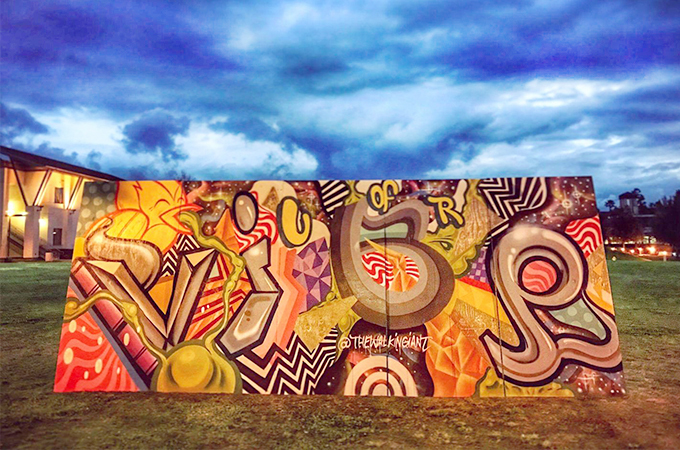 Painted by San Bernardino artist Ivan Preciado during the 2017 Alliance for Community Transformation and Wellness’ (ACTW) Vibe Festival, the mural was created to enhance students’ educational experience and wellness through art. The five-panel mural is titled Refine. The mural has been on display in the Armacost Library since September of this year. Interdisciplinary and Area Studies Librarian Shana Higgins notes that the reaction to the mural by both students and faculty has been positive. “I’m going to miss it when it’s gone,” says Higgins, who has watched students stop and study the piece. Thanks to the efforts of U of R School of Education Professor Janee Both Gragg, the mural will now go on to be displayed for six weeks at Redlands High School, Beaumont High School, San Jacinto High School, Grand Terrace High School, and Redlands East Valley High School. “After the festival in February, the mural was stored in a closet and I wanted to find a way for it to be seen,” says Both Gragg. Coinciding with the display of the mural on each new campus, high school administrators will have the chance to work with the U of R School of Education to provide enhanced health and wellness information to their campus and community. Both Gragg hopes that the mural will promote interesting and relevant conversation among students and allow them to consider their roles in engaging with art, education, and each other. Learn more about the Vibe Festival. Follow the Alliance for Community Transformation and Wellness on Facebook and Instagram.